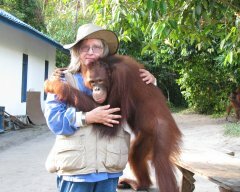 Dr. Biruté Mary Galdikas and Rod Brindamour established the first orangutan rehabilitation program in Kalimantan (Indonesian Borneo) in 1971 at Camp Leakey in what was then Tanjung Puting Wildlife Reserve, now National Park. A young orangutan awaits her release. The program started with one rescued orangutan infant, named “Sugito” in honor of a high ranking Forestry official who had accompanied Galdikas and Brindamour from Bogor to Kalimantan. 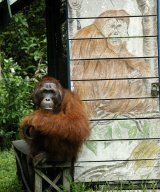 For the next twenty-five years or so, the orangutan rehabilitation and release program was located in the Park. Over the years working with the Park authorities, Galdikas established several other release sites within Tanjung Puting National Park (TPNP), including one at Tanjung Harapan and one at Pondok Tanggui. In total between 1971 and 1995 approximately 200 wild born ex-captive orangutans were released into the Park at these various sites although some of the males most likely did not stay within Park boundaries. 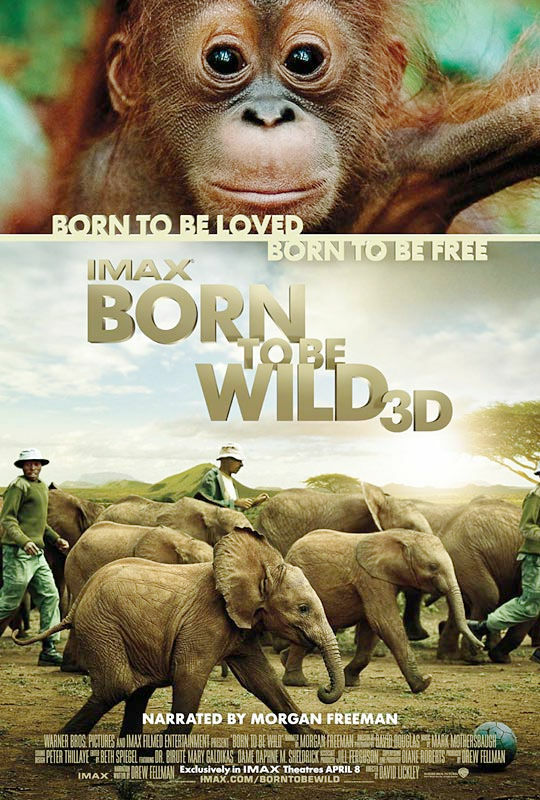 In 1995 the Indonesian Forestry Department introduced regulations that wildborn ex-captive orangutans should not be released into national parks where large populations of wild orangutans still exist. 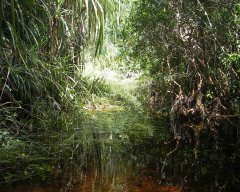 Tanjung Puting was one of these forests. 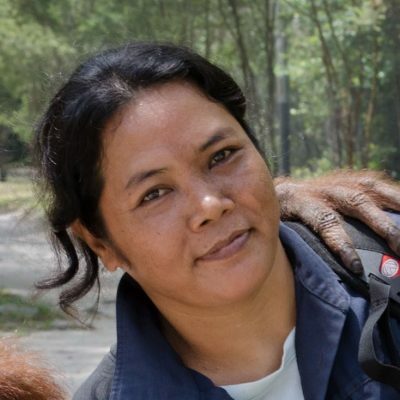 The goal of the new regulations was to protect wild orangutan populations from competition for food and mates and to prevent the possibility of introducing new diseases or parasites into wild populations. With a few exceptions, for many years to come, no more ex-captive orangutans were released at Camp Leakey or any of the other Tanjung Puting National Park release sites. 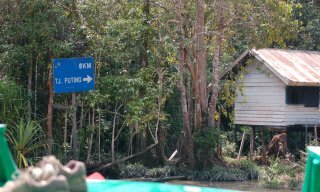 Camp Leakey (along with two other auxillary orangutan release sites and feeding stations managed by OFI in the Park, Tanjung Harapan and Pondok Tanggui) is the most popular attraction for international visitors in the province of Central Indonesian Borneo (Kalimantan Tengah). 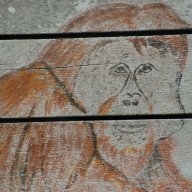 Although wild orangutans occasionally meander by and visit the feeding station, most of the orangutans that visitors see at Camp Leakey are wild born ex-captives, their offspring, or their offspring’s offspring. Nonetheless, when abundant fruit (orangutans’ preferred food) is available in the forest, visitors to Camp Leakey may not see a single orangutan at the feeding station for weeks at a time. Such was the case in March 2010. 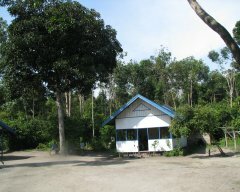 In 1998 Lamandau Wildlife Reserve, with its selectively logged forest, was established as a new location for the release of ex-captive orangutans into the wild. Subsequently orangutans from the Care Center were routinely released at Lamandau. The Lamandau Wildlife Reserve is the result of OFI working with local and national government officials to save two expired logging concessions from becoming a palm oil plantation. Bringing ex-captive orangutans to Lamandau Reserve for release. 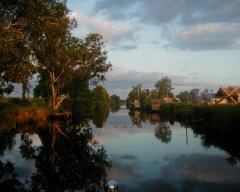 With the help of the Governor of Kalimantan Tengah and the Minister of the Environment, the mission to establish a government reserve where ex-captive orangutans from OCCQ could be released was accomplished on February 26,1998 when the Minister of Forestry decreed that 76,040 hectares near the Lamandau River now constituted Lamandau Wildlife Reserve. Since the Reserve’s establishment OFI has released 150 ex-captive orangutans from the OCCQ program and helped translocate ten wild orangutans from other areas where those particular orangutans were in danger for a total of 160 released orangutans. These OFI releases occurred during a ten year period spanning 1998 – 2008. 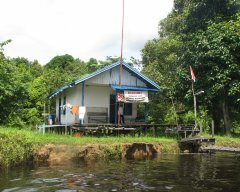 In 2008 OFI established a new release site in the Seruyan regency and subsequently, a second release site in the same general Seruyan forest. OFI no longer releases orangutans (or other wildlife) at Lamandau but recently renewed its commitment to orangutan management at Lamandau. 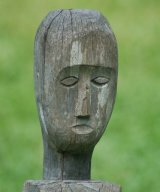 Unfortunately, the Reserve was reduced in size to 54,000 ha a few years after its establishment. 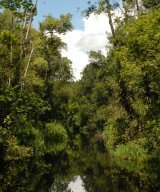 However, the national and local governments agreed that a relatively large area of lightly logged dry ground forest may be added to the Reserve in the future, perhaps increasing the Reserve’s area to the previous size. 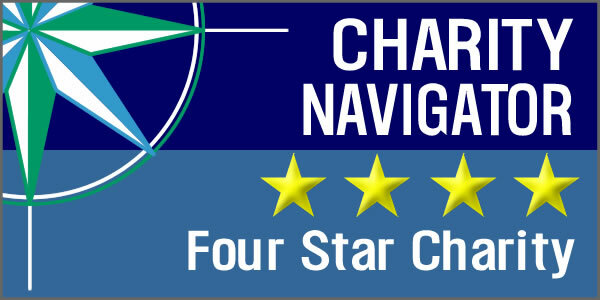 This represents good news because currently much of the Reserve consists of peat swamp forests. 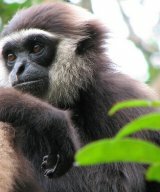 The addition of dry ground forest will substantially increase the Reserve’s habitat diversity. 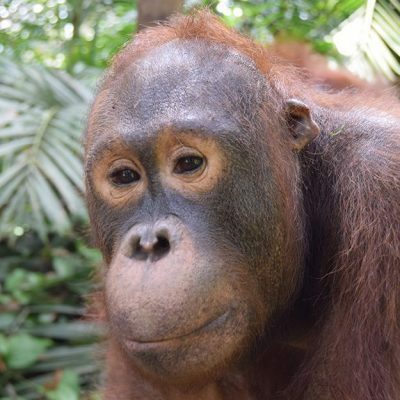 Management, conservation, and development work with local communities at or near Lamandau Reserve is currently carried out by The Orangutan Foundation (OFUK) based in the UK. 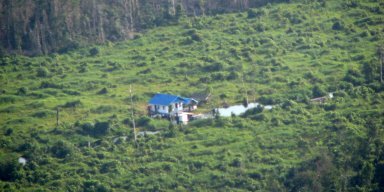 In accordance to local and national regulations relating to orangutan rehabilitation and release, Lamandau Reserve is not open to visitors. 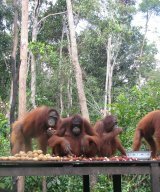 In early 2012 OFI began, once again, strongly supporting the management and monitoring of the orangutans at Lamandau, adding personnel and extra food to the feedings as well as routinizing the feedings. This extra concern may have helped contribute to a “baby boom” in 2013 among the wildborn ex-captive orangutan females in the area where OFI had a presence.